Hand made pieces of art with excellent components, from the selection of drivers to high end parts for the frequency network. The housing of our speakers is hand made. Customers can choose between a multitude of different finishing options: DIfferent wood veneers and lacquer. As option, our frequency networks, always equiped with custom made components, can be ordered in an extermal housing. This allows for actively driving every speaker with a separate amplifier. The tolerance between the channels is less then 0.1%. The top of the range model, Arabeske, is equiped with a 32cm Chitin bass with a 12kg magnet, a 17cm Chitin mid range speaker and Thiel ceramic tweeter. For the frequency range beyond 25Khz, we have developed a super tweeter, which transmits signals up to 110kHz. This represents a better performance for SACD material. Optionally the tweeter could be ordered as super high end diamond version. The base version is designed as passive system. This passive system could be upgraded with our active tube frequency network for active amplification. Our speakers are real time corrected systems, wich means, that a dirac impulse is almost 100% correctly transformed into an audio signal. Arabeske – big 2 way system with integrated subwoofer, connecting at 65Hz. Characteristics: 32cm Chitin bass, 17cm mid range speaker and 2.5cm Thiel ceramic tweeter. The subwoofer is mounted on the side to allow for superior and lean exterior. 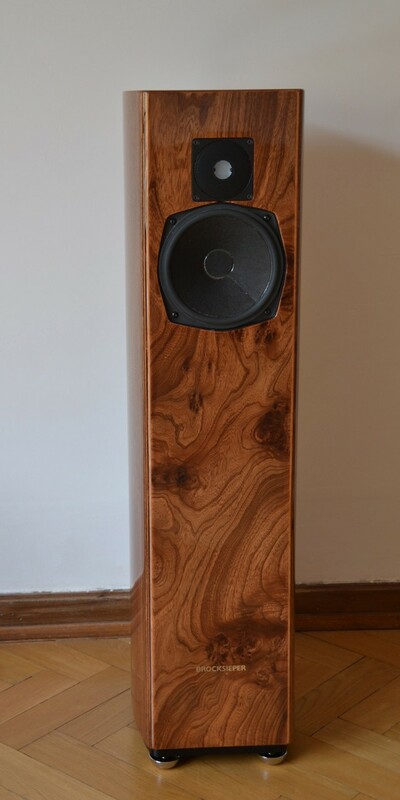 Minara – the little sister of Arabeske (2-way system) with 17.5cm Chitin low/mid range chassis and 2.5 cm Thiel tweeter.